I don’t have a bucket list a such, but if I did, white water rafting in Bali would be one of things that has been on my list for a while. Since we first started visiting Bali from Australia nearly 10 years ago, I have seen the posters advertising a boat smashing through raging rapids full of people having the best time. It always looked like a thrilling combination of danger and excitement that would definitely suit me down to the ground. 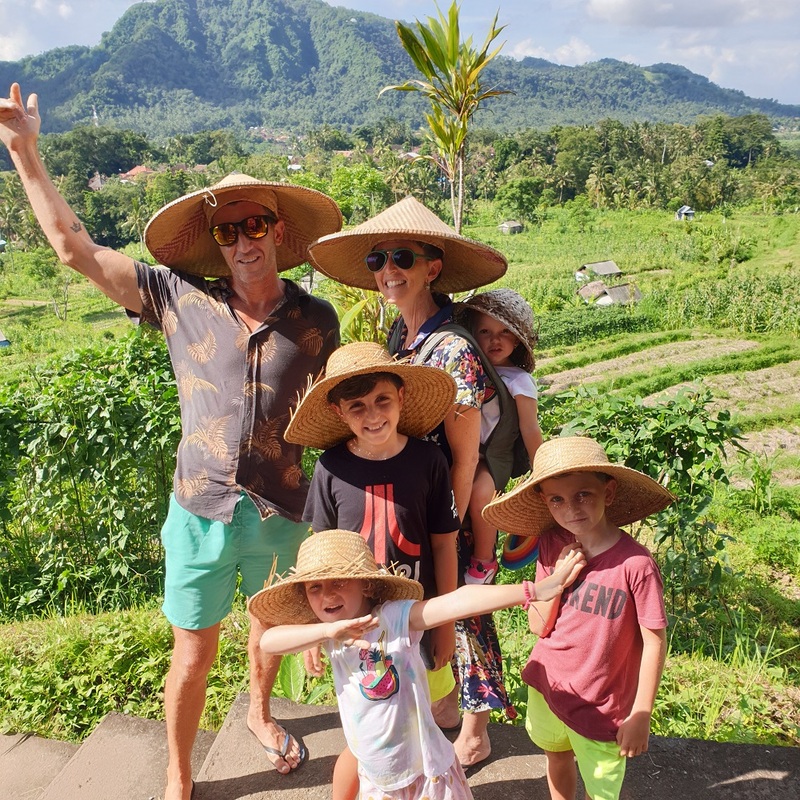 However, every time we have been to Bali, I have either had a little baby or have been pregnant, so unable to participate. This trip was finally my chance! 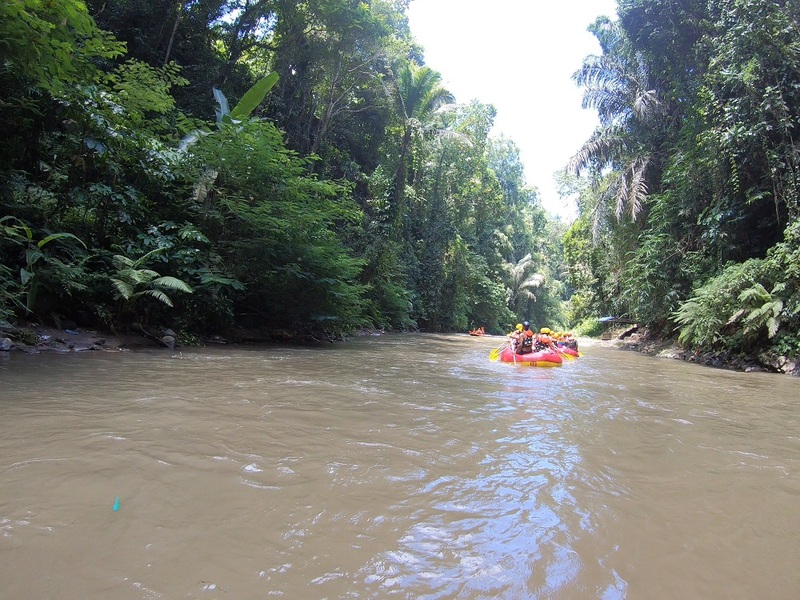 We used Get Your Guide to book our white water rafting in Bali. They had a few different options that I could browse and book from the comfort of my villa. 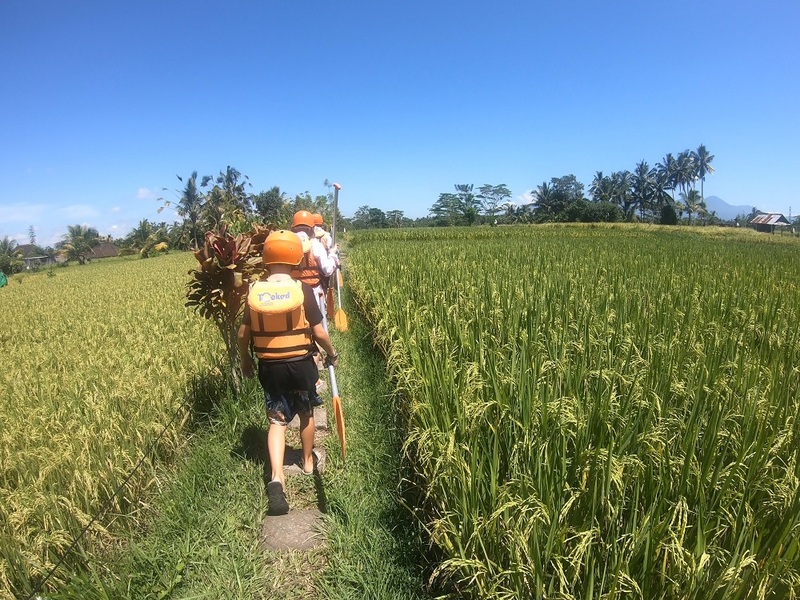 There are tour guides selling this adventure everywhere you go around Ubud. But you have no idea which company they are advertising, or how reputable they are. With Get Your Guide, at least we know they give the booking to the best guides with the best reputation. 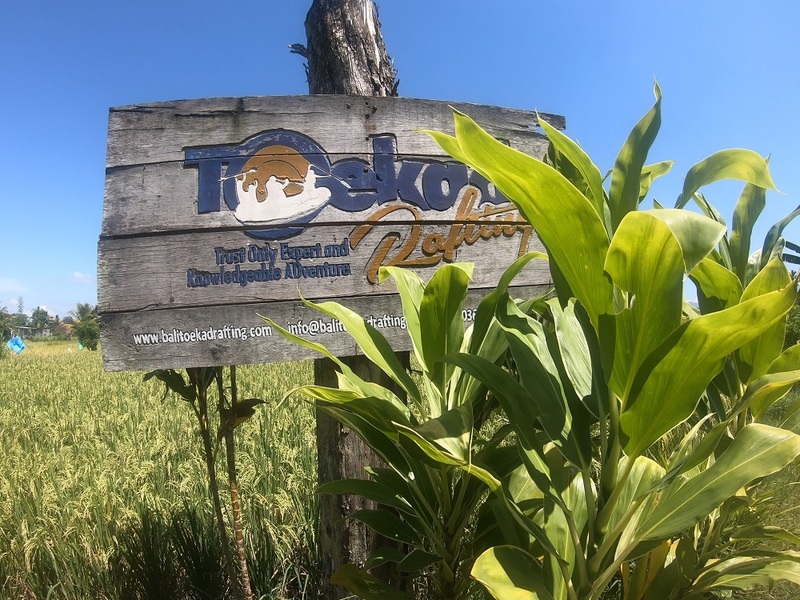 In our case, we went with Toekad Rafting which is the top company white water rafting Bali. Get Your Guide is free to use. 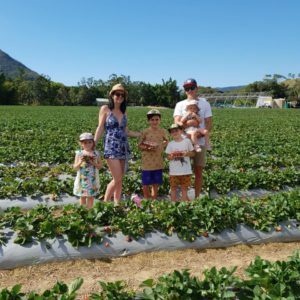 It’s fun to browse as you can put in any worldwide location and find local activities straight away. This was the first time we have used this company. I really like having a professional agency that takes care of things for me. Share this Pin to any Adventure Families! After putting in the location search term ‘Ubud’ I was able to browse 63 different Get Your Guide tours for the area. There was everything from rice terraces, Bali Zoo tickets and even riding in a jeep up to the summit of Mount Batur volcano! 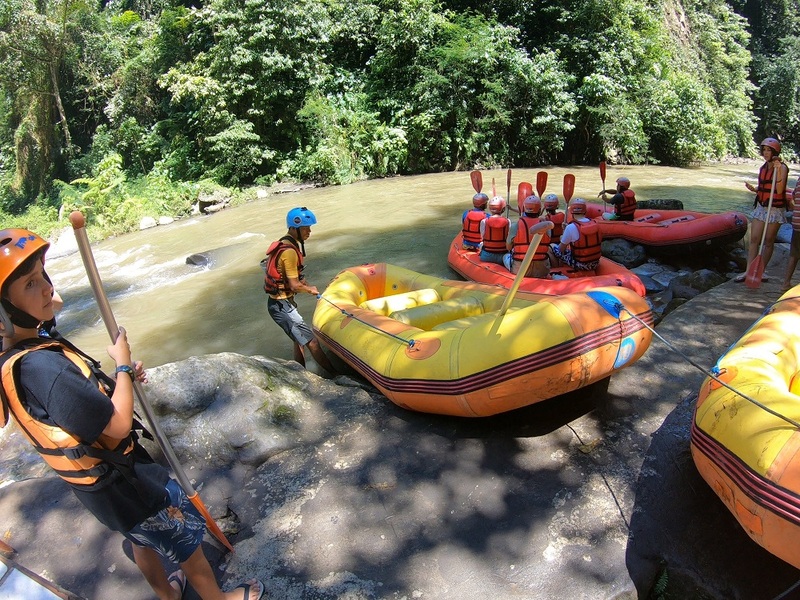 My search yielded 3 different tours for white water rafting Bali. Then I had to read the fine print and compare. I went with number one above. It had the most reviews, and was the cheapest with prices starting at $43. And participants could be as young as 9! 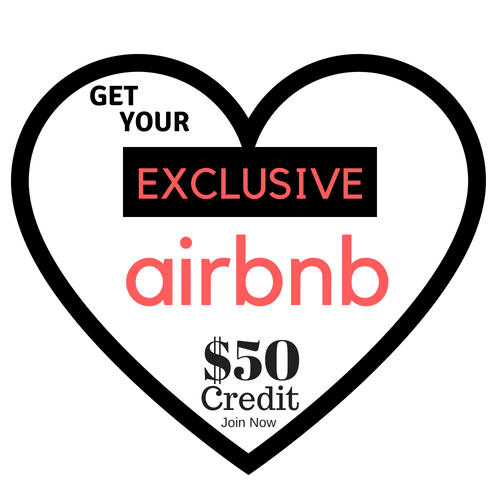 The best thing about booking this way is I could pay by credit card online. Better than carrying a heap of Indonesian Rupiah around with me to pay a guy in the street. I appreciate the security of this, and it also gave me insurance from my credit card as well. The price ended up being $70AUD for an adult and $64AUD for a child ticket. With everything that’s included, this represented fantastic value for an epic day out. The white water rafting adventure started with us waiting for our pickup. This was arranged on the website when I booked, but the pick up times were pretty vague. We sat for an hour in a hotel lobby, and ended up phoning the Toekad company to see if they were still coming! It turned out they were just around the corner and were definitely on the way. They were there in another few minutes. They ferried us in a private air conditioned car to the Toekad headquarters. Then we had a cup of tea and a cookie in lush green surroundings, waiting for the rest of the participants. Soon a bus full of Chinese tourists rocked up and then it was all systems go. Our guide Madig came and looked after us straight away. He equipped us with helmets, life jackets and a paddle. Then showing us where to put our things in a locker with a key. This was all included. Then our 6 person crew piled into a car and were on our way to our river adventure at last! After a 10 minute drive in awkward silence with our Chinese crew, Jasper and I whispering conspirationally between us, we arrived at the base. Then it was about a 15 minute walk through pretty rice fields. You could see across to Mount Agung here, then straight down a few hundred stairs. This was a hot and heavy walk. We were definitely buoyed by our enthusiasm for what awaited at the end, and by the promise of a refreshing river. Here, at last, were our fleet of red and orange rubber inflatable dinghies. They were lined up on the black sandy shore and ready for their crew. As we waiting for our safety briefing, we watched a few boats drift by. These were from up river, all hooting and splashing, having so much fun! Finally it was our turn. Our comfortable boats – Everybody in! We piled in, Jasper and I got the front position of course! And then listened as Madig repeated his instructions in English and then Mandarin. When he says “forward!” paddle forward, “stop!” you stop paddling and other such terms. Most importantly if you fall out, don’t panic and lay on your back. Got it! And we were off, joining the gentle flow of the river. In about 30 seconds we were deep into our first set of grade 2.5 rapids! Rapids are graded by their intensity up to grade 4 being the hardest. We got splashed left right and centre, we even got stuck on a rock more than once! You had to jiggle and bounce your way out of that. And Madig worked hard his magic paddle to set us free. In the smooth bits, you paddle hard with a call of “forward”. Then when it’s rocky and ‘white water’ you put your paddles upright in the boat. Then just hope for the best! It was so fun! Bumpy, wet, and exhilarating! Jasper and I had ear to ear grins the whole way! The Mighty River Agung makes its way down from volcano land. Then traverses between these towering cliff-like banks hundreds of metres overhead covered in jungle and overhanging vines. The bottom of the bank was this amazing carved rock. Pictures of Balinese stories depicted with crocodiles, mermaids, and more. Don’t ask me how they carved this all those years ago! We passed through 8km of these scenic riverbanks, in over 2 hours of refreshing fun. Half way along we stopped for a drink break. This was awesome. There was a black sandy beach, and knee deep water on a calmer stretch of river. Here there were a few women with a little stall selling cold beers, coconuts, softdrinks and cup noodles. The Bintang cost 50,000IDR and they encourage you to buy one for your guide as well. You don’t need to worry about carrying money. They give you an IOU slip that you pay back at the base anyway. No worries, and a great well-deserved break. We passed several impressive waterfalls plummeting into the river. The biggest of which we stopped at for a super wet photo call. Stopping directly under the heavy falls! It was awesome! There were a lot of boats doing the same thing, with a bunch of different tour operators. They all looked good. I was at first surprised at the number of boats, but there was this weird energy amongst all the rafters. Everyone was hooting, and singing, and you splash all the other boats as you try to overtake them. It was hilarious! It wasn’t crowded, but a couple of times I watched as one boat hurtled towards another boat that was stuck on a rock sideways and waited for impact. But it was fine. And we didn’t tip over either. The last bit of the paddle ends with a thrillingly steep downhill slide over a weir. You only have a narrow approach to this part. You definitely don’t want to miss it and go over the falls to the right! Then the ride is over. And you have to wearily trudge back up the riverbank hundreds of sweaty and puffing steps. Then it’s just down the road back to the Toekad Base. We passed women who’s job it is to carry the deflated boats up and down the stairs balanced on their heads. So we were glad we weren’t them! We had a hot shower, towels were provided. Then we had the opportunity to check out the photos that had been taken of us along the river and various photo points! They charged from 150,000IDR for 2 print outs. 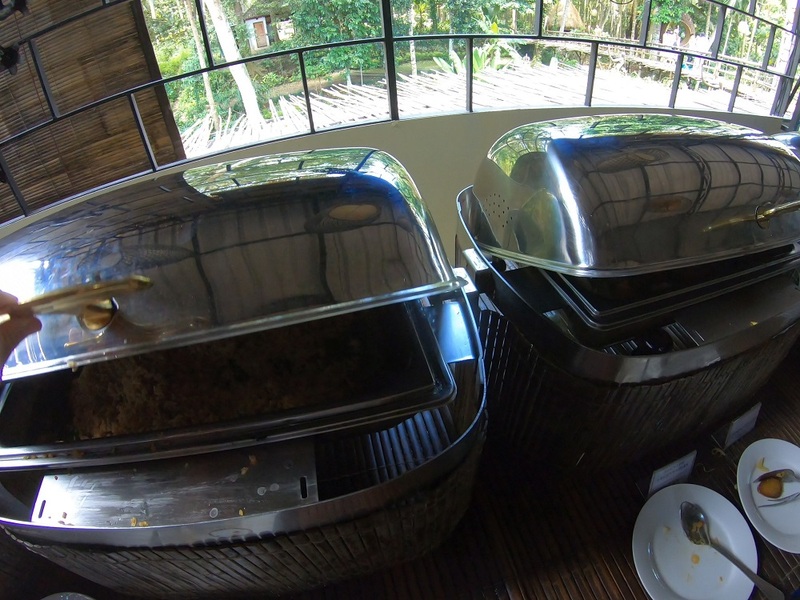 An Indonesian style buffet lunch is included in the price, as is drinking water. We had rice, fried potatoes, curry chicken, vegetables, fruit and salad to finish on. 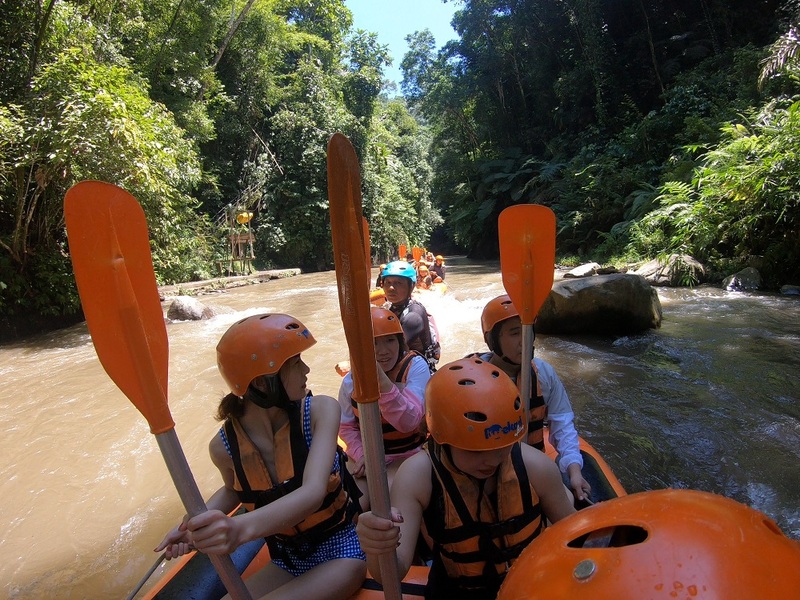 This was just a perfect way to end our epic white water rafting Bali adventure. Jasper gave the tour 9/10. He though the rapids were a little bit tame, but I saw his face as we were navigating our way through the tricky bits. He was blown away. I loved it too. 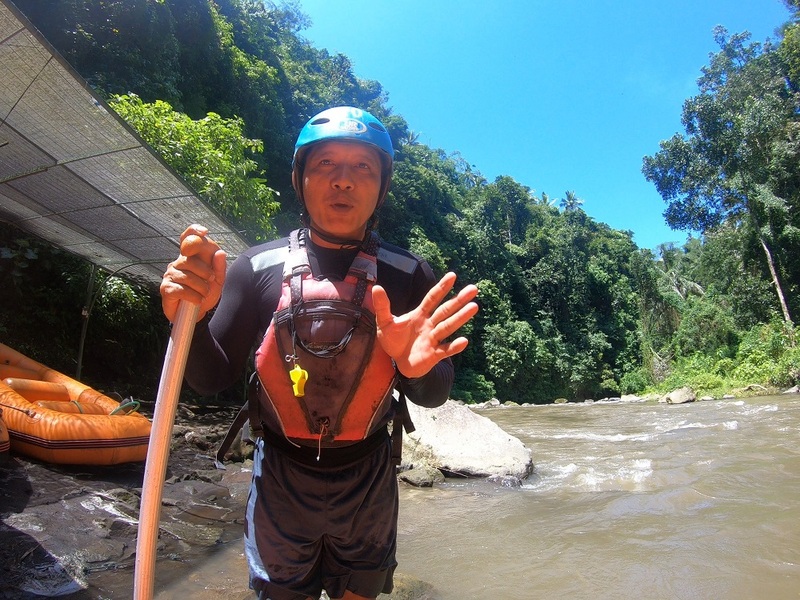 For something I have always wanted to try, white water rafting in Bali exceeded my expectations. I didn’t know it would be that fun, and that beautiful going down that river. 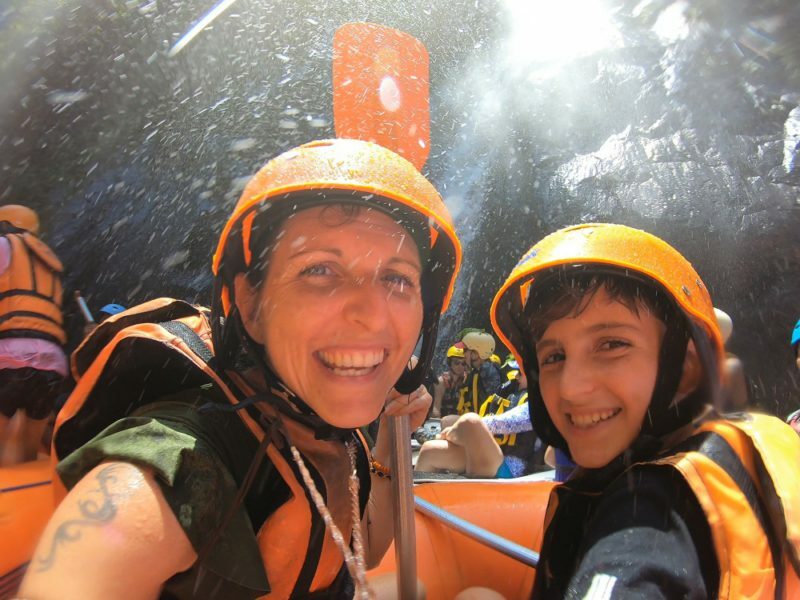 From the professionalism of the guides and equipment, to going under a massive waterfall. With the carvings on the rocks, and the delicious lunch at the end. I couldn’t recommend this tour more. 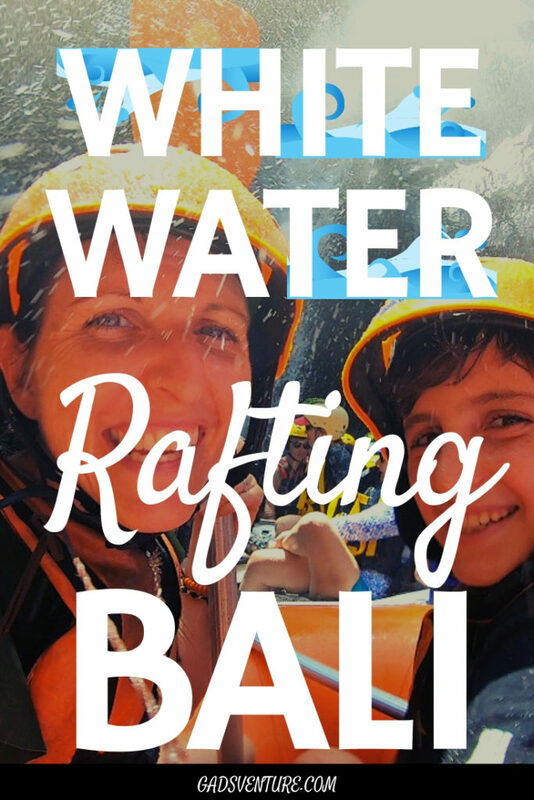 Please do yourself (and your kids over age 9) a big favour and take them white water rafting in Bali. You will not regret it! There’s not many places in the world you can do it for this cheap either! 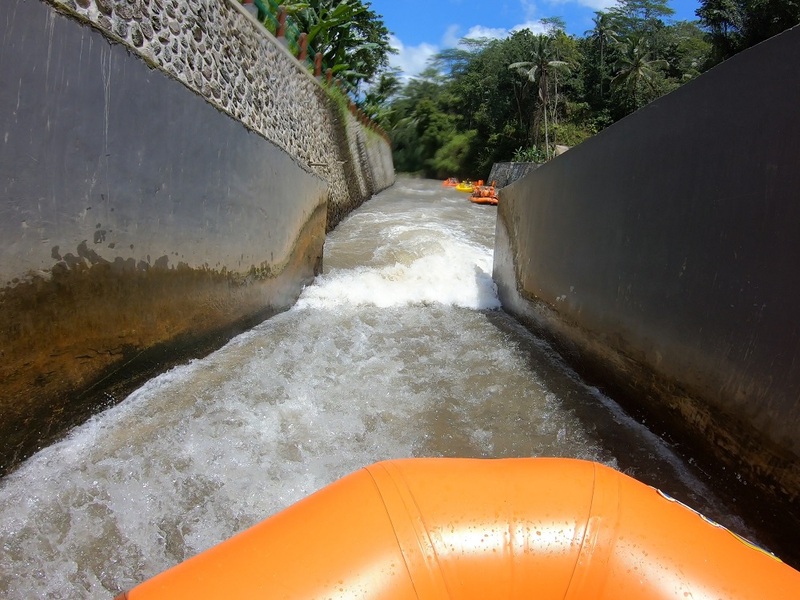 Have You Been White Water Rafting in Bali? Did you love it as much as Jasper and I? Comment Below!